Shiva, Vishnu, and Brahma are the major gods of Hinduism, and their functions are often interchangeable. An ancient god whose authority was derived from the Vedas (the scriptures of the ancient Aryans), Brahma retained his importance as the creator in Hinduism, although no cult comparable in size to those of Vishnu and Shiva developed around him. 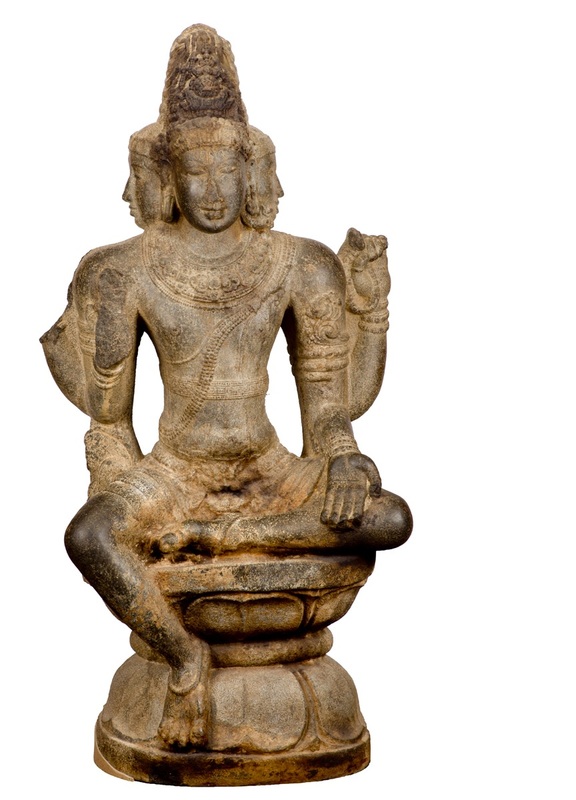 Broad, powerful shoulders, elegant proportions, and the exquisite workmanship of the jewelry identify this sculpture as a tenth-century Chola work. Looking at the four directions, the four faces of Brahma symbolize the four Vedas as well as the cardinal points of the compass. Two of the image's four original arms are now lost. The missing upper hand probably made the gesture of reassurance, while the lower one held a lotus. The upper left hand holds and counts a rosary; the lower left, now empty, may have held a pot containing the water from which the universe was created. Because the sculpture is not meant to be viewed in the round, the back of the figure is more shallowly carved and lacks the precise modeling of the front.